Following the “death” of a beloved, the end of a dream, there is much work to do to heal your broken heart. When you arrive at a place where you have a clear understanding of What Your God Is. And when you know, at a deep, deep level, that The Relationship Continues and that Words Have Power and that the way you consciously choose to Tell Your Story creates peace or pain, then you are ready for this book. Then you are ready. Really ready for Becoming Radiant. 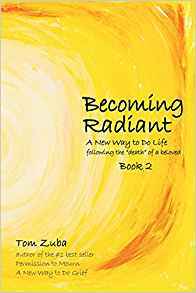 You will know when you are ready for Becoming Radiant. Trust your gut. Your heart. Your intuition. Trust your body, your God-given-barometer recognizes truth by the way it feels. Truth feels expansive. Trust that.